Former Saints prop Campese Ma'afu has joined Leicester Tigers as injury cover. Fiji international Ma'afu was due to join ambitious Championship club Ealing Trailfinders ahead of the new season. But he has now been handed an opportunity at Tigers as cover for injured England prop Ellis Genge. Ma'afu, brother of another former Northampton prop, Salesi Ma'afu, made 35 appearances for Saints after joining from French Pro D2 club Provence in February 2016. The 33-year-old proved to be a useful stand-in for Alex Waller. But with loosehead prop Will Davis arriving from Ealing this summer, Ma'afu was not handed a new deal. And he will now link up with Leicester. Tigers head coach Matt O’Connor said: “We’re obviously disappointed to have Ellis sidelined for the start of the new season after suffering a knee injury on the England tour in the summer and we look forward to seeing him back to full fitness in due course, but Campese is a very experienced prop with good knowledge of Premiership and European rugby. 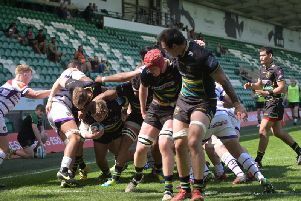 After his departure from Saints was announced back in April, Ma'afu said: “To be able to run out in front of the crowd at Franklin’s Gardens has been a great experience, and I’m proud to have played for a great club in Saints.